Oxford United manager Darren Patterson has brought in three new players on loan deals whilst releasing Frenchman Alex Jeannin. 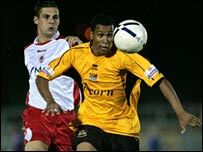 Striker Matt Green has re-joined until the end of the season from Cardiff after an earlier spell at Oxford. Morecambe left-back Michael Howard has also signed on a short-term deal. Justin Richards completes the trio of new aquisitions, arriving at the Kassam Stadium from Kidderminster Harriers until the season's end. Alex Jeannin has gone in the other direction, moving to Aggborough in a three month deal.